If, despite our reservations, you decide to embrace the HDMI form factor, then the VivoStick PC is likely to be a good candidate. It is cheap, well designed, has enough ports on offer and a newer Cherry Trail CPU. Asus has finally joined the growing ranks of vendors selling Windows-based HDMI dongles with a new model called the VivoStick, otherwise known as the TS-10. Carrying a recommended price of $129 (about £84, or AU$184), it is significantly cheaper than the competition (such as the Intel Compute Stick). There are two things that differentiate it from the others though – it comes with Windows 10 as the default OS (rather than Windows 8.1) plus it uses an Intel "Cherry Trail" processor rather than the ubiquitous but hopelessly slow Bay Trail one. Physically, the device is significantly larger than the others we've seen but still portable enough to carry in your pocket (don't forget the power supply unit though). Asus says it was inspired by the fountain pen but the design is actually closer to pen scanners like the IRIScan Pen Executive. The anthracite model which we were shown had a rubbery finish (the VivoStick will also be available in blue and white) and sports a cap to hide its HDMI connector. At the opposite end of the stick is the power button that lights up when on, and can be used as a male plug for the HDMI cap. 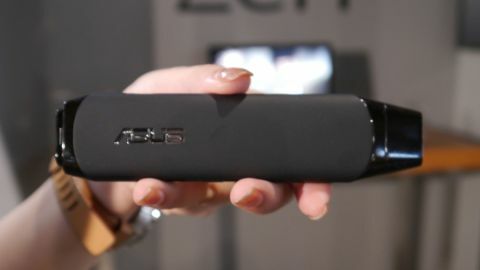 Although it measures just 137.9 x 34.0 x 14.9mm and weighs only 68g, Asus has managed to cram a lot of connectivity in here; there are two full size USB 2.0 ports, an audio socket and a micro-USB port which is used for power only. Asus didn't say what processor powered the unit but it is almost certainly the Intel Atom x5-Z8300. That part is a 14nm model that dissipates a mere 2W. That may explain the notable lack of conspicuous air vents as was the case on the Compute Stick. By inference, one may also deduce that the CPU is fanless. Alongside its four cores clocked at 1.44GHz (reaching 1.84GHz in Burst mode) are 2MB cache and an Intel HD graphics subsystem. It supports up to 2GB of DDR3L RAM but is still hampered by the fact that it can only address one memory channel. The rest of the hardware that makes up the unit is fairly standard: 2GB RAM, 32GB on-board storage, Wi-Fi and Bluetooth 4.0. The obvious feature missing is a microSD card slot to increase the storage capacity, and it's a shame that was left out. Unfortunately, the demo unit was not plugged into a monitor so we couldn't either benchmark it or test it properly. Note that we didn't see the power supply unit on the stand. Asus will also provide a mobile app that will allow the user to control the stick. Availability of this app as well as the VivoStick PC TS10 has yet to be confirmed. We never really warmed to HDMI dongles, whether on Android or Windows because of the compromises you have to make with that form factor and the Asus VivoStick PC is no exception. Its size is likely to be an issue if you plan to plug it directly into the back of your monitor or television and its weight could stress your display's HDMI connection especially if it faces the wall rather than the floor. Sure you could get HDMI extensions, adaptors or hubs but doing so defeats the purpose of having an elegant solution. Add in the need to find yet another plug to power the VivoStick and it just doesn't add up. Consumers might find a tablet (like the Linx 7), or a netbook-like laptop (like Asus' own X102BA) or one of the many diminutive PCs that have recently launched (like the HP 260 G1) to be much better bets.